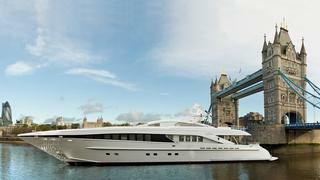 The 37 metre motor yacht Ilona has been sold with Burgess acting for both buyer and seller. Built in aluminium by Dutch yard Heesen Yachts to a design by Omega Architects, Ilona was delivered in 2007 and recently went back to the yard for a thorough refit, including a complete paint job. Accommodation is for up to 12 guests in five cabins consisting of a master suite, VIP suite, a double and two twins, each with a Pullman berth. The aft deck has upholstered wicker and cream sofas and a large table that can be lowered to act as a cocktail table in front of the large flat screen television. Inside the main saloon the circular dining table is located aft, comfortably seating eight guests. The flooring is in dark bamboo contrasted with cherry wood paneling and joinery. State of the art audio/visual systems are installed including a kaleidescape server supplying on-demand movies and music to the aft deck, main saloon and master suite. Ilona was asking €8.75 million.